Yu Aoi on Asahi TV’s Tetsuko’s Room | personal.amy-wong.com - A Blog by Amy Wong. The interview is good, we learn a bit — including two questions that some fans wanted to know, or at least that’s what your questions were about. What was her favorite role (or at least that’s what I understood when she replied), and a bit about her family… which also gave us some new photos – including this one! The interview seems more relaxed, maybe it’s the setting… but some of her previous interviews weren’t this relaxed and there’s so much giggling! Maybe it’s because she’s older, or maybe it’s because she’s pimping Raiou hard. Because you know Raiou needs to open pretty big – at least #1 of the Japanese releases this week, and if there aren’t any big Hollywood films opening, it needs to be #1. Anyway~~~ thanks to endomameo2010 for the upload. If the upload gets deleted, please~~~ could we talk about posting somewhere where it won’t get deleted? Also, anyone translation? Or maybe just a brief on what was talked about… if anything important? Tetsuko-san started off talking about how pure and beautiful she is, and how cute she was in the portrait. She then proceeded to ask how long did she grow out her hair. She said that she always have grown out her hair since she was born, so she never really cut that much of hair. They started to talk about the picture on the start of the show and Tetsuko-san commented that she has long legs and was really cute. As she has started classical ballet since she was 2, she has to keep a long hair to keep them on a bun. Tetsuko-san then said that she went to watch “Otouto” together with Yamada Yoji-san. Apparently he isn’t the type to praise people much, but he praise Yuu-chan that she did really well. Since he probably won’t say it when he sees Yuu-chan, so Tetsuko-san decides that she has to tell this to her. They started to talk about her role in taiga drama (Ryomaden?) and how difficult it is, as she has to learn a lot of things to be able to get into the role, like learning shamisen. She mentioned how she didn’t know that they’re not allowed to look at the shamisen while playing. They also talked about how being an actress gives an opportunity to learn different things which you can’t try out in other occupations. It’s like a live with a series of unexpected things to learn about, like being a geisha and having to learn hula dance in “Hula Girls”. Then they talked about how back then for the “Annie” musical she failed 4 times, but she kept going on for it. Tetsuko-san wondered why she failed although she was so cute. After the first time she failed, apparently her feeling about being able to be accepted in “Annie” has pretty much disappeared but she made friends with people there since most of the time spent during audition is waiting time (around 8 hours). Since they all live far away from each other, they can’t really see each other, so using the “Annie” audition they meet every year, so it feels like a class reunion and going for it was really for the sake of meeting friends. When she got accepted, she was in the first year of junior high school and her school disallows anything related to entertainment world so she sent the audition secretly. But at that time she was also having tests, so she was thinking what a bad timing. So instead of feeling “yay!” she felt more of “what to do…” But her mom says, “since you got accepted, why don’t you try?” Tetsuko-san then mentioned that her mom likes takarazuka and Yuu-chan said that her mom has always thought that if she has a daughter, she will put her to takarazuka, but since Yuu-chan already got accepted to Annie so her mom just roots on her for it. Her dad was totally against it, since he helped out with her studies he asked if she would just let all her hard work go in vain and he’s really really worried about letting his daughter to go to Tokyo. Despite that, finally he let it go and she managed to be appearing in “Annie”. She initially wasn’t thinking about entertainment world but she really just wanted to be accepted in “Annie”. She also talked about how tough/strict it is during the practices but the kind words that is given from time to time helps to push her to do her best. 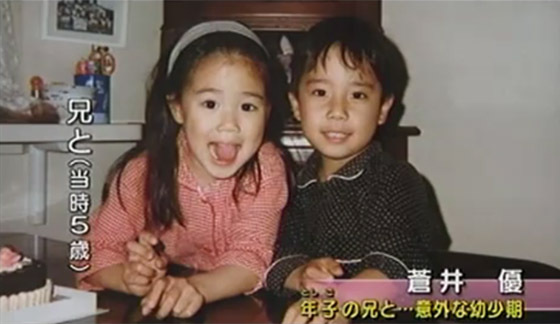 They moved on talking about her brother and how he had a very cute looking face (he has one year difference), apparently her mother thought that she (Yuu-chan) was a failure because her face was not well constructed/was weird (not very sure on this…) but basically they used to have this sending postcards with the pictures of their kids but they stopped it when Yuu-chan was born, after finally her face constructs well (I think?) they resumed sending the postcards. Tetsuko-san asked if her brother gets asked about her, but since Aoi Yuu isn’t her real name, people usually don’t notice. But Yuu-chan said that their faces look alike so once people notice that, it would be obvious. Tetsuko-san started to talk about how it’s better to have a fake name in entertainment world and how her surname is very common so it’s easy to get noticed. Then Yuu-chan mentioned how she had played a role named Kuroyanagi Tetsuko before in “Hana to Alice”. Her role was this girl whose parents are divorced so initially her name was Kuroyanagi Tetsuko but it became Arisugawa Tetsuko instead. Then after the PR of that movie, she went to eat with the producer and somehow along the way Tetsuko-san passed by and they were really shocked. They started to talk about how she often comes out in movies with interesting titles like “All About Lily Chou Chou” and Tetsuko-san said how probably the directors always have had this image of Alice in Wonderland when seeing her, like how it’s always interesting. She then asked if Yuu-chan wants to try to play in Alice in Wonderland, she replied that she loves it but if she plays the role of it she will be scolded by the fans of Alice throughout the world. Then Tetsuko-san told her about how she watched the 3D movie of Alice in Wonderland and she fell asleep midway so somehow she had this thought that she was at home watching TV so she was really shocked when a rabbit just jumps out (because it’s 3D) so as the end credit rolls ends, the rabbit disappears and she realises it’s only a movie. I don’t really get it but she mentions how she was the only one in the theatre so maybe that’s why? But Tetsuko-san says that she really wants her to do Alice in Wonderland and asked again if there’s really no one asking her to do it. Then they started to talk about Raiou and her horse riding. It took three months of practice of horse riding as in the movie she has to be riding a horse whenever moving around. She said that the horse has a good personality and was really nice so it was really helpful. The last shot shown of Raiou was actually taken from a helicopter and it was hard because if the helicopter comes too close, both her and the horse will start to be tilting because of the wind. Then she mentioned how there are series of “tragedies” that happened during the filming and both the casts and the production side had to go through a lot of things and finally they managed to do it. She said that she only fell once from the horse during the practice and apparently it was taken by the making of camera but because it was too “great” they didn’t put it in (if I’m not wrong). Get Hana & Alice on Region 1 DVD Now!